There are recipes here for both Salsas and Pico de Gallo. In Mexico, any sauce you put on food is called Salsa. If you are in a restaurant and ask for Salsa, they will most likely provide you with Ketchup or Salsa picante in a bottle, but it won't have little chunks of fresh tomato and onion like you get at Mayan Beach Garden and are served at better restaurants. Pico de Gallo isn't really considered a Salsa, so if you are at a restaurant, don't ask for Salsa if you really want a little Pico de Gallo. Marinating Habanero and onion in lime juice makes this a perfect condiment for Mexican food. 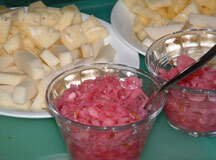 Using purple onion creates a fabulous pink color that will leave everyone wondering what is being served. If you don't like your food "pica" omit the habanero chili and it will have a sweet taste. This is always served with Cochinita Pibil, the pork that is traditionally marinated and slow cooked in banana leaves. Directions: Chop Onions and Habanero. Squeeze the juice of the limes over the onions and habanero mix. Put in a bowl with a tight lid and shake well. You can serve it immediately, but it will be nothing special. Put it in the refrigerator and every day for at least 2 days shake it well so that the lime juice totally coats the mixture. After a couple of days, taste for heat and add additional habanero if desired. Also salt to taste at this time. After it has marinated for a week, you can add cilantro when you serve is if you like.This salsa lasts several weeks in the fridge. NOTES: When handling Habaneros, it is wise to use gloves or hold it with a fork while you cut it, because if you rub your eyes after deseeding them, your eyes could burn for a long time. This is the version of Pico de Gallo that we make and serve the most at Mayan Beach Garden. We serve it with eggs, rice and beans, soups, tacos, and everything else at almost every meal. 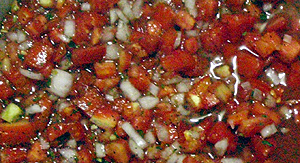 Directions: Chop tomato, onion and serrano pepper; combine in a bowl. Slice the lime into two halves and squeeze over the mixture. Add chopped cilantro and stir well. Let sit for 1/2 hour and salt to taste. The lime will pickle this mixture and it will store in the refrigerator up to a week but we like it fresh and make it a couple of times a day. Directions: Place first three items on tinfoil and put the tinfoil on a dry frying pan or directly over a gas flame and char or "Asado" the items. To "Asado" the Serranos, garlic and onions, loosely make a little oven with the tinfoil. You check often and turn the items until they are charred or blackened on all sides but not on the inside. The garlic should give slightly when pressed and the onions and serranos should be soft. Place the Tomatillos in a pan and cover with boiling water. Boil just until soft and remove the tomatillos with a slotted spoon. Squeeze out the garlic from the paper outsides and place everything (except the paper outsides of the garlic) into the blender with the remaining ingredients. Blend until creamy. If you like your salsas milder - remove the seeds from the inside of the serranos before the Asado process. If it accidentally turns out too hot - add additional avocado, lime and salt. This sauce is not too hot and perfect for those who like the taste of Chipotle chilies, but not the heat. Like it hot? Add more chilies. Use the type of chilies that are in Adobo sauce and purchased in cans in many stores in the US. Tomatillos look like small green tomatoes, but are often sold with a paper like shell on the outside. In Mexico they are called Tomate Verde (Green Tomatoe) while Tomatillos are a tiny version of the Tomate Verde. 6-8 tomate verde (Tomatillos in the US) (small to medium size - about 2" in diameter) washed and with outside paper shell removed. 3-4 chipotle chilies with seeds removed. Directions: Place first three items on tinfoil and put the tinfoil on a dry frying pan or directly over gas and char or "Asado" the items. To "Asado" the Serranos, garlic and onions, loosely make a little oven with the tinfoil. You check often and turn the items until they are charred or blackened on all sides but not on the inside. The garlic should give slightly when pressed and the onions and Tomatillos should be slightly soft. Squeeze out the garlic from the paper outsides and toss everything (except the paper outsides of the garlic) into the blender with 3 chipotles. Salt to taste. It is delicious on meats and not too hot. Add water if you want it a little thinner. Its a very thick sauce. Vary the heat by adding additional chipotles or include the seeds. Keeps well in the refridgerator.